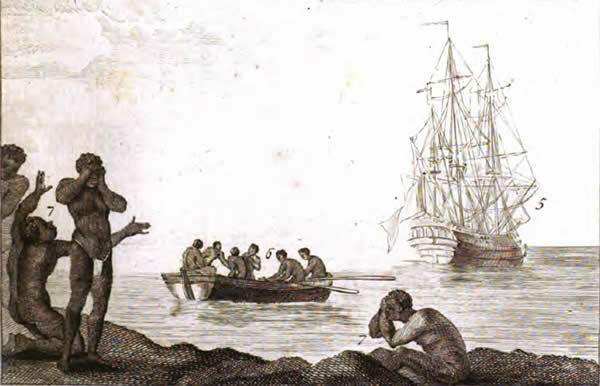 After permission has been obtained for breaking trade, as it is termed, the captains go ashore, from time to time, to examine the negroes that are exposed to sale, and to make their purchases. The unhappy wretches thus disposed of, are bought by the black traders at fairs, which are held for that purpose, at the distance of upwards of two hundred miles from the sea coast; and these fairs are said to be supplied from an interior part of the country. 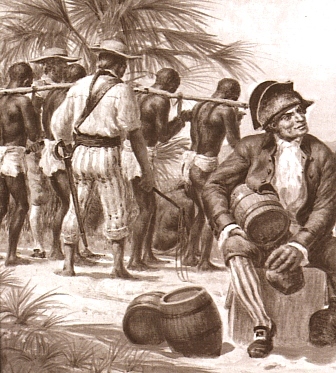 Many negroes, upon being questioned relative to the places of their nativity have asserted, that they have travelled during the revolution of several moons, (their usual method of calculating time) before they have reached the places where they were purchased by the black traders. At these fairs, which are held at uncertain periods, but generally every six weeks, several thousands are frequently exposed to sale, who had been collected from all parts of the country for a very considerable distance round. While I was upon the coast, during one of the voyages I made, the black traders brought down, in different canoes, from twelve to fifteen hundred negroes, which had been purchased at one fair. They consisted chiefly of men and boys, the women seldom exceeding a third of the whole number. From forty to two hundred negroes are generally purchased at a time by the black traders, according to the opulence of the buyer, and consist of those of all ages, from a month, to sixty years and upwards. When the negroes, whom the black traders have to dispose of, are shewn to the European purchasers, they first examine them relative to their age. They then minutely inspect their persons, and inquire into the state of their health; if they are afflicted with any infirmity, or are deformed, or have bad eyes or teeth; if they are lame, or weak in the joints, or distorted in the back, or of a slender make, or are narrow in the chest; in short, if they have been, or are afflicted in any manner, so as to render them incapable of much labour; if any of the foregoing defects are discovered in them, they are rejected. But if approved of, they are generally taken on board the ship the same evening. The purchaser has liberty to return on the following morning, but not afterwards, such as upon re-examination are found exceptionable. [Pullout: Rejected slaves beaten or killed] The traders frequently beat those negroes which are objected to by the captains, and use them with great severity. It matters not whether they are refused on account of age, illness, deformity, or for any other reason. At New Calabar, in particular, the traders have frequently been known to put them to death. Instances have happened at that place, that the traders, when any of their negroes have been objected to, have dropped their canoes under the stern of the vessel, and instantly beheaded them, in sight of the captain. The man negroes, on being brought aboard the ship, are immediately fastened together, two and two, by hand-cuffs on their wrists, and by irons rivetted on their legs. They are then sent down between the decks, and placed in an apartment partitioned off for that purpose. The women likewise are placed in a separate apartment between decks, but without being ironed. And an adjoining room, on the same deck, is besides appointed for the boys. Thus are they all placed in different apartments. [Pullout: Crowded conditions on slave ships] But at the same time, they are infrequently stowed so close, as to admit of no other posture than lying on their sides. Neither will the height between decks, unless directly under the grating, permit them the indulgence of an erect posture; especially where there are platforms, which is generally the case. These platforms are a kind of shelf, about eight or nine feet in breadth, extending from the side of the ship towards the centre. They are placed nearly midway between the decks, at the distance of two or three feet from each deck. Upon these the negroes are stowed in the same manner as they are on the deck underneath. In each of the apartments are placed three or four large buckets, of a conical form, being near two feet in diameter at the bottom, and only one foot at the top, and in depth about twenty-eight inches, to which, when necessary, the negroes have recourse. It often happens, that those who are placed at a distance from the buckets, in endeavouring to get to them, tumble over their companions in consequence of their being shackled. These accidents, although unavoidable, are productive of continual quarrels, in which some of them are always bruised. In this distressed situation, unable to proceed, and prevented from getting to the tubs, they desist from the attempt; and as the necessities of nature are not to be repelled, ease themselves as they lie. This becomes a fresh source of broils and disturbances and tends to render the condition of the poor captive wretches still more uncomfortable. The nuisance arising from these circumstances is not infrequently increased by the tubs being much too small for the purpose intended, and their being usually emptied but once every day. The rule for doing this, however, varies in different ships, according to the attention paid to the health and convenience of the slaves by the captain. They are commonly fed twice a day, about eight o’clock in the morning and four in the afternoon. On most ships they are only fed with their own food once a day. Their food is served up to them in tubs, about the size of a small water bucket. They are placed round these tubs in companies of ten to each tub, out of which they feed themselves with wooden spoons. These they soon lose, and when they are not allowed others, they feed themselves with their hands. In favourable weather they are fed upon deck, but in bad weather their food is given them below. Numberless quarrels take place among them during their meals; more especially when they are put upon short allowance, which frequently happens, if the passage from the coast of Guinea to the West-India islands, proves of unusual length. In that case the weak are obliged to be content with a very scanty portion. Their allowance of water is about half a pint each at every meal. It is handed round in a bucket, and given to each negroe in a pannekin; a small utensil with a strait handle, somewhat similar to a sauce-boat. However, when the ships approach the islands with a favourable breeze, they are no longer restricted. Threats to those refusing to eat -- Upon the negroes refusing to take sustenance, I have seen coals of fire, glowing hot, put on a shovel, and placed so near their lips, as to scorch and burn them. And this has been accompanied with threats, of forcing them to swallow the coals, if they any longer persisted in refusing to eat. These means have generally had the desired effect. I have also been credibly informed, that a certain captain in the slave trade, poured melted lead on such of the negroes as obstinately refused their food. 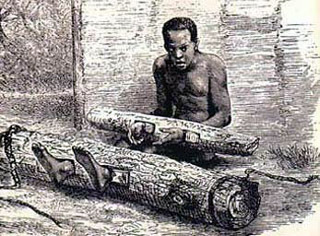 The hardships and inconveniences suffered by the negroes during the passage, are scarcely to be enumerated or conceived. They are far more violently affected by the sea-sickness, than the Europeans. It frequently terminates in death, especially among the women. But the exclusion of the fresh air is among the most intolerable.… The confined air, rendered noxious by the effluvia exhaled from their bodies, and by being repeatedly breathed, soon produces fevers and fluxes, which generally carries off great numbers of them.